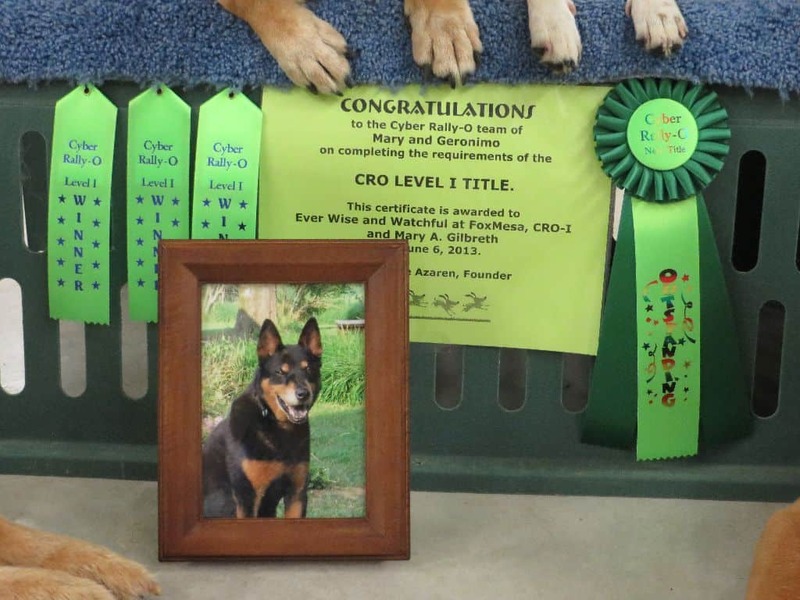 On June 06, 2013, three days after he passed away, Geronimo was awarded his Level 1 Cyber Rally O Title (CRO-I). Following a splenectomy and diagnosis of hemangiosarcoma, Geronimo lived one month. The splenectomy improved his quality of life, we had a beautiful month, he felt better than he had in many months since his symptoms appeared. Alas, it did not improve the quantity of his life and he left us far too soon, 11.5 years young. Geronimo’s qualifying runs are shown below and were filmed during his final week. They were our last training sessions together. 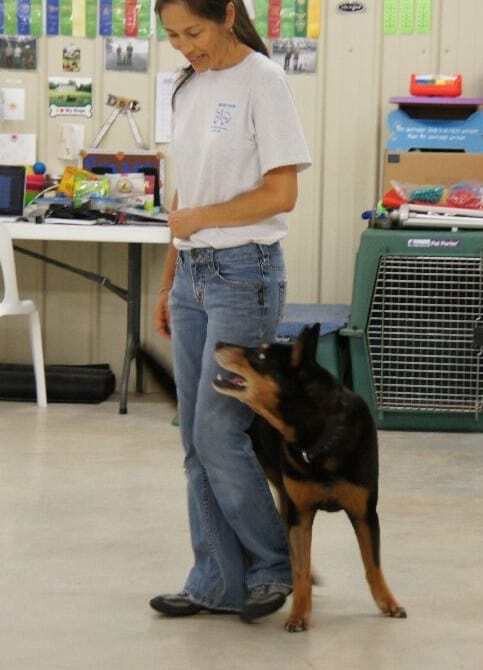 G’ had not practiced heeling or Rally for some time, we had been focusing on agility prior to his illness. Yet he knew and remembered each station with ease. He performed them with his shiny eyes, happy mouth, intense enthusiasm, and “ready to rock” attitude. Yes, his strength was diminished so we took our time. I watched carefully so he didn’t overdo. 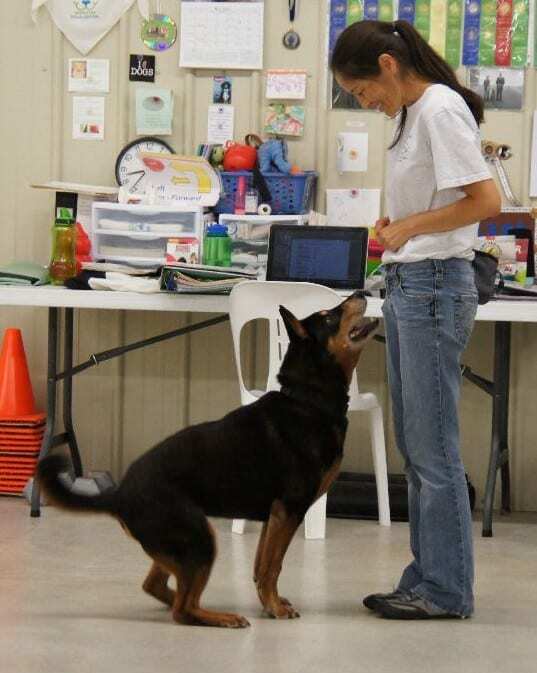 The pics of us shown above were taken May 30th while he assisted me in teaching my Rally Class. Between many breaks, he demonstrated stations beautifully, he made new friends (heart-warming for any dog but especially for G’ who was once terrified of meeting new humans, going new places, etc. ), and had a wonderful time. He was shining, his happiness was clear. As much as I hoped he could join us again the following week, I sensed it was his last time to assist at SMART DOGS and that our time together was coming to a close. I hope to one day share more about Geronimo and who he was, and attempt to convey all that he meant to me, all that he taught me in our 11 years together. Saying more at this time is too painful. Until then, I share these videos of my dear friend, protector and teacher – Ever Wise and Watchful at FoxMesa CRO-I CGC “Geronimo”. *My Thanks to the amazing Jude Azaren, founder of Cyber Rally O. She gives abundant time, energy and knowledge to the humans and canines of CRO. Jude, along with the wonderful CRO members, ensures the venue is a supportive and positive one. Jude and all in CRO (people and dogs), thanks for your support.